Mike Breidenbach is the Director of Piping at Macalester College and is the Pipe Major of their Grade 3 competition band. He has been a full time bagpipe teacher and performer since 1999. He began learning at Macalester College in 1992 under the tuition of Andrew Hoag. Later he studied with Donald Lindsay, Jim MacGillivray, and the late Lindsay Kirkwood. In 1997 and 1998 he was awarded Champion Supreme by the Midwest Pipe Band Association in Grade II as a soloist. He is now recognized as an accomplished Grade I piper. Mike has also played with the City of Chicago Pipe Band which competed in Grade 1. He was the piper for the world premiere of the opera "Silent Night." Mike has appeared on A Prairie Home Companion, and performed on stage with The Minnesota Orchestra, The Cheiftans, Blink-182, Brian Adams, The Rochester Symphony, the Minneapolis Pops Orchestra, Alasdair Fraser and Natalie Hass, and the Saint Paul Civic Symphony. He has been the opening act for The Black Watch and Rod Stewart among others. 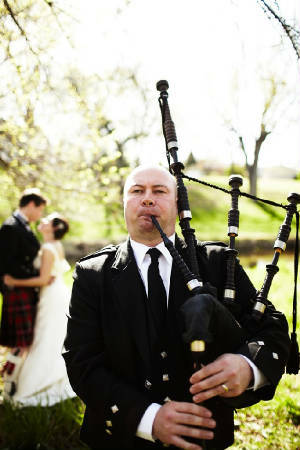 Brian Solum began his piping endeavor in 1993 with the Macalester College Pipe Band under former PM Andrew Hoag. Since then he has obtained private bagpipe tution from the likes of John Cairns, Alisdair Gillies, James McIntosh & Jake Watson. 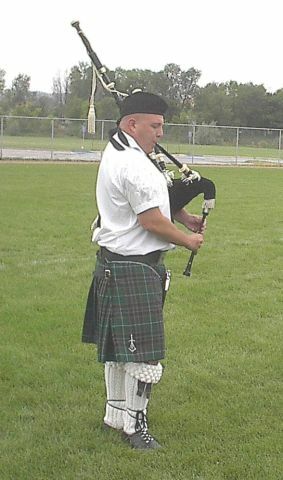 Between 2000 and 2005, Brian formed and led the 1st City Pipe Band in Bemidji, MN while assisting the Fort Frances Highlanders (Ontario) at the same time. At the moment, Brian is once again an active member of the Macalester College Pipe Band and competes with the Grade 3 band and is a Grade 2 competitor on a solo basis. More recently, Brian was honored to lead the US Mens & Womens Olympic Curling Teams on their way to Torino, Italy in 2004. He has also performed with the bands Celtic Crossing & Ceilidh.